By Wor. Kimball W. Martin. In looking over the records of Caleb Butler Lodge, that cover the past seventy-five years, I find very much interesting material, much more than I can bring before you in the time allowed for this purpose this evening. However, what I have to offer are a few of the highlights concerning the doings of this Lodge, from its beginning under Dispensation in 1859 to the present time. On the first page of the first record book, I find the following: "To keep a fair and impartial record of the proceedings of each meeting receive all Monies, pay them to the Treasurer, taking his receipt therefor. At the right (sic) of the Worshipful Master." Of course this was the old style wording of the Secretary's duties. This was possibly put here that the Secretary might not waver in the line of his duty. And yet possibly it was put here as a ready reference in case the Secretary forgot his lines. "At a meeting of Master Masons, held at the house of Brother E. Dana Bancroft, South Groton, Mass., March 17, 1859. For a choice of Officers and to adopt measures whereby a Lodge of Master Masons may be empowered to work, under a Dispensation. Bro. E. Dana Bancroft was chosen Chairman and Bro. Arthur Fenner Secretary. Voted that the name of the Lodge be Excelsior. That our regular communications be held on the first Monday evening, after the full moon, in each month. Adjourned to meet at the call of the Master. Arthur Fenner, Secretary." A Ways and Means committee was appointed and then they adjourned to meet at the regular Communication at the Lodge-room. Signed William F. Goulding, Secretary." The grandson of Brother John Quincy Adams McCollester, who was one of the founders of this Lodge, is at present sitting in the West: our "pillar of Strength" Brother Harvey Quincy McCollester. The first Lodge-room was located in a building locally known as the "Break of Day" and stood where the old Globe Hotel was. These quarters were occupied a little over a year. At the first regular communication of Excelsior Lodge, held April 18, 1859, it received its first application from George S. Evans. During the first year under Dispensation fifty-one meetings were held and thirteen candidates Raised to Master Masons. Here we see the Lodge well started, with prospects for a successful future. Many of the Brethren were not satisfied with the name of Excelsior for the Lodge. It therefore was decided to call it Caleb Butler Lodge, honoring Most Worshipful Bro. Caleb Butler, who was a Past Master of St. Paul Lodge 1833—1836. He was also Most Worshipful Grand Master of Masons in Massachusetts 1841-1842. Caleb Butler was a man highly respected by all. The Brethren felt that in the selection of this name, for the Lodge, they would have something more appropriate. A Charter was granted Caleb Butler Lodge, by the Grand Lodge of Massachusetts, March 14, 1860. The Lodge was Constituted by Grand Lodge Officers March 26, 1860. And from the records we learn that a very impressive service was rendered. "Caleb Butler Lodge was formed on this occasion, situated so far north of the Ecliptic, that the Sun with its cheerful rays, was unable to warm it, And the brethren found themselves in the dark and very cold. But the light from the Blazing Star in the East and the warmth of fraternal love, soon changed our Lodge-room into a warm and cheerful retreat. Signed William F. Goulding, Secretary." I rather suspect that the Secretary's desk might have been located some distance from the stove. About this time the Lodge moved to new quarters, to a building on the site where Carley's Block now stands. And after the disastrous fire of 1872, in which the Lodge lost everything except the Charter and records, they took quarters in the Harvey Woods Building that stood on the site of our present quarters. Three Officers' Jewels were recovered after the fire. They may be seen in a frame in the Tyler's room. The records of an early meeting show that the Lodge was visited by the D. D. G. M. and suite. After the work of the evening they adjourned to the Refreshment room at the Railway Station. After enjoying the speeches and good things they went home in good season and in good condition. The Lodge remained on this location until Page's Block was built. On October 6, 1873, the new quarters in Page's Block were dedicated by the Grand Lodge. The record is very complete and covers twenty-five pages of our record book. At this time St. Paul Lodge moved from Groton and shared these quarters with us. In 1899 the Lodge moved from Page's Block to our present quarters, the first communication being held January 30, 1899. On April 19, 1899, these Apartments were dedicated by the Grand Lodge. Previous to the dedication ceremony, a banquet was served in Page's Hall. A rather amusing incident occurred at this time, It happened that the Ladies Temperance Society, were holding an Ice Cream and Cake sale that evening in Page's Hall. The Caterer, wishing to help them, donated the cream he had left from the Masonic banquet. The Ladies were very thankful, The cream was in great demand. Later, to their consternation, they learned that they had been serving "Rum Pudding." I find complete records of fourteen Brothers who served in the difficulty between the North and the South. Brother Leander G. King, home on a furlough, visited Caleb Butler Lodge January 20, 1862. He was Captain of Company C, 16th Rgt. He was also Master of Army Lodge No. 2. He told of the difficulties in holding their meetings in tents and said he had learned from prisoners who had been at Richmond, that those who were Masons were sought out by the Southern Brothers and rendered many favors. The next we hear from Bro. King was that he was killed in the battle of Gettysburg, July 2, 1863. Past Master O. N. Wing was delegated to go to Gettysburg and procure the remains, which he did. On July 22, 1863, he was buried with Masonic Honors, Caleb Butler Lodge officiating. After the Lodge had continued forty years, the membership in 1900 was 144 members. In 1910, 240 members, 1920, 663 members, 1925, 791 members. Present membership 604. Our largest gain was made between 1917 and 1925, which was a gain of 516 members in eight years. This was due to applications coming from soldiers at Camp Devens. Not only did we make these members for our own Lodge, but worked degrees on as many more as a courtesy to other Lodges. We had the honor of raising one Candidate who had been passed in Texas and initiated in South Dakota. Lodge meetings at this time were very interesting as Brothers came here from all parts of the Country. Candidates raised were Arthur U. Johnson and Robert Clifford Bailey. This was necessary as the 76th Division was moving overseas, and our candidates were members of this Division. Our By-Laws contain the names of nearly seven hundred Brothers who served in the World War. Out of all these members who served in this War, only one met death in battle. Lt. Bro. Richmond Young was killed in France October 10, 1918. He received the Degrees in Caleb Butler Lodge and became a member May 24, 1918. My history of this Lodge would be incomplete, if I failed to mention the names of Worshipful Bro. Henry A. Brown, Rt. Worshipful Bro. Augustus A. Fillebrown, and Worshipful Bro. Timothy Cleary. These Brothers as well as many others, gave to this Lodge their time and unlimited service, Worshipful Bro. Bigelow having served as Secretary for twenty-eight years. Our Great Light tells us that the span of a man's life is three score years and ten. I infer that the life of a Lodge may go on forever. In closing I desire to pay tribute to all those Brothers who have worked so hard to make this Lodge the success that it is today. My toast to the Lodge is: That it may continue to carry the high standard of Masonry on down the years, until time shall be no more. By Wor. Frederick H. Brown. Back in the days of 1857 and 1858 there were several Masons living in Groton and its environs who were interested enough in Masonry to want to perfect themselves in the work of the ritual and to gain a more thorough knowledge of the laws, customs, history and teachings of the Order. With this in mind, they were accustomed to convene at convenient times and places. Finally they became imbued with the desire to form a new Lodge, and for this purpose, met at the home of E. Dana Bancroft on the corner of Williams and Nashua Streets, South Groton, now Ayer. They organized themselves with E. Dana Bancroft as Chairman and Arthur Fenner as Secretary. They voted that the name of the Lodge be Excelsior, and that the regular communication be on the first Monday after the full moon in each month. The time of the meetings has since been changed to the second Monday of the month, where it is at the present time. For officers, they elected E. Dana Bancroft as Master, Oliver N. Wing as Senior Warden, Augustus Dike as Junior Warden, Arthur Fenner as Treasurer and William F. Goulding as Secretary. They voted that the ten members present be responsible for fifteen dollars for the purpose of obtaining a dispensation from the Grand Lodge to work the degrees in Freemasonry. They then adjourned to meet at the call of the Master. Evidently the petition was favorably received by the Grand Lodge for they received a summons from the Master to meet again on March 28th. At that time the dispensation was read, and they proceeded at once with the election of the remaining officers. It was voted that a committee of five be elected, to be known as a Ways and Means Committee, to obtain enough money by loan or otherwise on the best possible terms to furnish lodge-rooms, and to properly expend that money. They then adjourned to the regular communication at the lodge-rooms. To help defray the expense of the quarters, they sublet the rooms to Harmony Division, No. 98, of the Sons of Temperance. The rental fee was to be $37.50 per quarter and a proportionate share of the cost of maintenance for meetings every Friday. The rooms proved unsatisfactory because of poor ventilation. They were heated by a wood-burning stove which smoked badly because of a defective chimney, and lighted by lamps which burned a kind of oil which was used before the advent of kerosene. Steps were immediately taken to procure new quarters, but because of a lack of vacancies, all efforts to do so were in vain. Finally, in August 1860, the Lodge did move to a building occupied by the store of Phelps and Harlow which stood where the First National Store is today. At the first meeting of the Lodge on April 18, 1859, the first application for membership was received from George E. Evans, and after rehearsing the degrees for a month under the coaching of E. Dana Bancroft, they were successfully given to the candidate. Also at that meeting the first visitors attended. They were W. B. Haskins of Erie Lodge, Buffalo, New York, and Silas Nutting of Saint Paul Lodge, Groton. During the first year, fifty-one meetings were held and thirteen new members were enrolled. When the year of working under dispensation was ended, the Lodge received a charter from the Grand Lodge, regularly issued by the Grand Master, Winslow Lewis, Jr., and it was constituted and consecrated by Deputy Grand Master Jerome V. C. Smith, and the officers were installed by William D. Coolidge, Junior Grand Warden, on March 26, 1860. The name on the charter was changed to Caleb Butler because it was thought to be more appropriate than the first chosen. Times were difficult for the new organization for the first few years. The Civil War was just beginning, the ranks of members were thinned by enlistments in the army, and the interests of people were diverted by difficulties incident to the war. To make matters worse, the Lodge was deeply in debt, but by dint of borrowing with no other collateral than the integrity of those doing the borrowing, they managed to exist. In 1870, Saint Paul Lodge of Groton used the rooms of Caleb Butler Lodge on a trial basis, rent free, and in 1872, they moved permanently with the consent of the Grand Lodge. The two Lodges have lived together ever since, sharing the expense of quarters proportionately. At the installation banquet in 1874, the following toast was proposed: "To St. Paul Lodge; at once our sister and mother lodge. We were nursed into existence by some of her most prominent members." In 1872 a calamity struck. The entire north side of Main Street was destroyed by a fire which lasted for two days, on April 13th and 14th. The Lodge lost everything except the charter and records, which were saved. However, the Irish Benevolent Society came to the rescue by offering to all the fraternal organizations which were burned out the use of its quarters in Cushing's Grain Store on the south side of the street, rent free. Caleb Butler Lodge availed itself of the offer, but as they had no paraphernalia with which to work degrees, they used to travel to Fitchburg, via the Fitchburg R. R., to use the property of the Lodges there whenever the occasion required. The townspeople began at once to recoup their losses, and when enough capital was raised to build the Page Block, extending from Washington Street to Pleasant Street, the Masonic Lodges and the Odd Fellows rented the entire third floor, the Odd Fellows taking the part to the west of the stairway and the Masons to the east, with a banquet hall used in common. This hall was used until 1899, when the North Middlesex Savings Bank built its new building where it stands today. Both Lodges of Masons engaged the entire third floor of this new building and have remained there ever since. The corner-stone of the new edifice was laid with full Masonic ceremonies on May 7, 1898, with Albert L. Harwood, Deputy Grand Master of the Grand Lodge, acting for the Grand Master. The copper box in the stone contains all the pertinent papers and records of the fraternal organizations, churches, town departments, post office, court and library of the town, together with the photographs and other valuable evidence of conditions which existed at that time. The first meeting of the Lodge in its new home was held on January 30, 1899. The hall was dedicated jointly by Caleb Butler and Saint Paul Lodges with appropriate Masonic ceremonies. Since the dedication, other Masonic bodies have become tenants: Bancroft Chapter, R. A. M., in 1901; Ida McKinley Chapter, O. E. S., in 1904; Ayer Chapter, Order of DeMolay, in 1924; and just this year the Order of Rainbow Girls. During its existence, Caleb Butler Lodge has had nearly 1900 members sign its By-Laws. They have in the course of time scattered to all parts of the world because of the distribution of the U. S. Army. Many, of course, have died, withdrawn from membership, or left the ranks through lack of interest because, living at a distance, they have been unable to keep in touch with the Lodge, and have joined other Lodges nearer their homes. Concerning one hundred years of living much can be said, and it would take a book of many pages to tell the complete story. Caleb Butler, Grand Master of Masons in Massachusetts 1841-1842 was born in Pelham, New Hampshire on 13 September 1776. Graduated Dartmouth College in 1800 and in 1802 became preceptor of the Groton School of Groton, Massachusetts, where he taught for eleven years. During those years, he studied civil engineering and the law and was admitted to the bar in 1814. He resided in Groton until his death 7 October 1854. He entered St. Paul Lodge and St. John R. A. C. of Groton, Massachusetts. He served as its Master in 1833, District Deputy Grand Master from 1814 to 1817. His civic duties in Groton includes serving as Town Clerk, Selectman, Postmaster and Chairman of the Board of County Commissioners. On 17 March 1859 a group of Masons met at E. Dana Bancroft home in South Groton (Ayer, MA) to form a new lodge - Lodge Excelsior, with E. Dana Bancroft as its first Master. Its first Regular Communication was held on 18 April 1859, at a place called "Break O Day" where Moores/Nashoba Travel now stands. The Lodge changed its name to Caleb Butler Lodge and a Charter was granted on 14 March 1860. Sometime in August 1860, the Lodge moved into new quarters on the "Phelps and Harrow Building" and remained there until the Great Fire of 1872. During this period, fourteen brethren served with the Union Army. Brother Leander G. King, a Captain with Co. C-16 Regiment, was killed at the Battle of Gettysburg. On 18 April 1870, Caleb Butler and Saint Paul Lodge began sharing quarters in Groton Junction. The Toast at Caleb Butler 1874 Installation Banquet was proposed "To Saint Paul Lodge, at once our sister and mother Lodge. We were nursed into existence by some of her most prominent members." From 1872 to July 1873 after the Great Fire which destroyed most of Main Street in Ayer, they then met at various places including the Irish Benevolent Society Hall located in the Harvey-Woods building now the quarters of the North Middlesex Bank. On 6 October 1873, both Lodges moved to their new Masonic apartments, Page Building, Ayer. Most Worshipful Sereno D. Nickerson dedicated the quarters and Wor. Henry A. Brown served as Master of Caleb Butler Lodge. On 13 December 1887, the Lodge moved to the Savings Bank Building (now North Middlesex Bank, Main Street, Ayer). The dedication and laying of the cornerstone on 7 May 1898 by Deputy Grand Master, Right Worshipful Albert L. Harwood, who tried by jewel to be square, level and plumb and anointed with corn, wine and oil while the Chaplain invoked the blessing of God. The 50th Anniversary was held on 14 March 1910. Most Worshipful Dana J. Flanders, Grand Master of Masons of Massachusetts, attended the ceremonies. During the First World War, Caleb Butler Lodge experienced its largest membership growth from 134 members in 1918 to 516 by 1925. By the end of WWI, several hundred members had served with honor with only one death, Lt. Brother Richmond Young, who was killed in France. The 75th Anniversary was held on 18 June 1934, with Most Worshipful Curtis Chipman, Grand Master of Masons in attendance. During the Second World War, meetings were held in the Federated Church, Ayer, due to the lack of heat. During this period, Caleb Butler had another mass increase in membership with over 700 total membership. The 100th Anniversary was held on 3 June 1960 with Most Worshipful Laurence E. Eaton in attendance. The exercises were held at the Page Street School. On 24 August 1975, a new gravestone was placed on Most Worshipful Caleb Butler's grave by Most Worshipful Stanley F. Maxwell, presiding Grand Master. On 10 June 1984, Caleb Butler Lodge celebrated Saint John Sunday at Saint Anthony's Roman Catholic Church, Shirley, Massachusetts. History was made. "A Polish priest is assigned to French parish and the Masons are welcomed here today to worship with us". The Worshipful Master was Wor. Eugene C. Wixom, who is the Master builder of our present quarters The Masonic Building, Sculley Road, Ayer, Massachusetts. In May 1990, after 91 years the two Lodges moved to new apartments "the Pleasant Street School". The newly renovated quarters was the creation of our Master Architect, Worshipful David J. Daiken with the help of the members of both Caleb Butler and Saint Paul Lodge.In September 1998, Saint Paul Lodge moved to Ashby, Massachusetts. On 7 May 1999, the Lodge participated in removal of the copper box from the cornerstone in the North Middlesex Bank Building and the insertion of the new time capsule. During this period an opportunity arose and the Calvary Baptist Church was sold to the Ayer Masonic Association. Thus, the Brethren of the Lodge, with Wor. Eugene Wixom as its Master Architect, started renovation in the spring of 1999. Caleb Butler Lodge had its first Communication in its present new quarters in September 1999, with Wor. Rafael P. Quinones as Master. The Building to be dedicated on 20 November 1999 by the presiding Grand Master, Most Worshipful Fred K. Bauer and the presiding Master Worshipful Charles H. Jones. History prepared by: Wor. Anthony R.M. Caprio. Grand Lodge Officers perform the rededication ceremony at Caleb Butler Lodge. Caleb Butler Lodge, in Ayer, celebrated its 150th Anniversary this year with a rededication ceremony followed by a banquet presided over by Most Worshipful Roger W. Pageau, Grand Master of Masons in Massachusetts. The Lodge began life in 1859, in what was then called South Groton, with the name of Excelsior Lodge. According to the lodge history, recently updated by Wor. Charles H. Jones and Rt. Wor. Richard W. Van Doren, lodge members grew dissatisfied with this name. “… the name Excelsior as at that time it was commonly attached to merchandise of questionable quality and the brethren wanted to select a name that was something to be lived up to instead of the reverse…” So it was that the name was changed in honor of Bro. Butler who was a Past Master of St. Paul Lodge (mother and sister lodge of Caleb Butler Lodge) and Grand Master of Masons in Massachusetts. Caleb Butler’s long association with nearby Fort Devens and the military began during the Civil War. Fourteen members served in the Union Army including one who was killed at Gettyburg and buried in 1863 by Caleb Butler Lodge with full Masonic honors. Nearly 700 members served in World War I. During the Second World War, Caleb Butler increased its membership by 100 men, not including courtesy degree work performed on brothers stationed at Fort Devens for other lodges all over the country. Demonstrating the lodge’s continuing vitality and commitment to Masonry, Caleb Butler received the Grand Master’s Award in 2007 and again in 2009 when it was one of only six Massachusetts lodges to receive this honor. March 17, 1859 to June 10, 1984 By Wor. David J. Dakin, P. M.
The following is a brief compilation of some of the important or interesting events extracted from the minutes of Caleb Butler Lodge on the occasion of its 150th anniversary. The history of the first 125 years was compiled by Wor. David Joy Dakin for the 1251 anniversary. R. W. Richard Witt Van Doren and Wor. Charles Howard Jones added the most recent 25 years. It must be stressed that this is merely a brief summary of events and in no way attempts to recount the entire history of the Lodge. Many events were not included for the sake of brevity. The Lodge is blessed to have some members that have been active for many years such as R. W. H. Arnold Wilder. These "senior" members have a wealth of history and stories, some of which were not recorded in minutes. To learn more of the details of our history, the authors encourage all to speak with those senior members. We are certain that you will be rewarded with very interesting tales. In going over the records of the Lodge for the past one hundred twenty five years, which comprises 1394 Regular Communications and 2049 Special Communications, I found a great deal of interesting history. This is not offered as a complete history of Caleb Butler Lodge but a brief account of the record of the Lodge from its beginning under dispensation in 1859 until the present time. On March 17, 1859 a group of Masons met at the home of E. Dana Bancroft in the village of South Groton, now known as Ayer, for the purpose of choosing officers and adopting measures to establish a Masonic Lodge under dispensation. It was voted that E. D. Bancroft serve as Chairman, Arthur Fenner as Secretary, and the name of the Lodge be Excelsior. It was further voted that the Regular Communication would be held on the first Monday after the full moon of each month. Officers elected at the first meeting were as follows: E. D. Bancroft Worshipful Master, O. N. Wing Senior Warden, Augustus Dike Junior Warden, Arthur Fenner Treasurer, and William F Goulding Secretary. The ten Brothers present were: J. Q. A. McCollister, G. W. Standish, H. P. Nichols, E. D. Bancroft, B. F. Taft, G. J. Woodbury, W. F. Goulding, W. A. Hayward, J. Gleason, and A. Fenner. These Brothers became responsible for the fifteen dollars required for the Dispensation from the Grand Lodge. On March 29, 1859, a special meeting of the petitioners was held at which time the dispensation from the Grand Master was read and the remaining officers elected. They were as follows: John M. Roberts Senior Deacon, Geo J. Woodbury Junior Deacon, Geo H. Champney Senior Steward, Geo W. Standish Junior Steward, Leander G. King Marshall, Daniel L. King Tyler, and J.Q. A. McCollister Chaplain. The first Regular Communication of Excelsior Lodge was held on April 18, 1859 at which time the Lodge received its first application from George S. Evans. Fees for the degrees were established as follows: $5 with the application, $5 for each degree to the total of $20. The records do not indicate where the first Lodge Rooms were, but from other sources we learn that they were in a place called the "Break O Day" which was located in a building between what is now the Mobil station and Moore lumber. Under dispensation, Excelsior Lodge held fifty meeting and raised thirteen Master Masons. "The subject of changing the name of the Lodge had been talked among the Brethren considerable and there was a good deal of dissatisfaction with the name of Excelsior as at that time it was commonly attached to merchandise of questionable quality and the Brethren wanted to select a name that was something to be lived up to instead of the reverse, and they finally settled on the name Caleb Butler for the name of the Lodge. Caleb Butler was a member of Saint Paul Lodge and held office of Master from 1833-1836 and was Grand Master of Masons in Massachusetts in 1841-1842. The Brethren felt that adopting his name for the Lodge they had an honorable name and one which stood for something in the community." A charter was granted to Caleb Butler Lodge by the Grand Lodge of Massachusetts on March 14, 1860 and was consecrated on March 26, 1860 by the Rt. Wor. Deputy Grand Master, Brother J. V. C. Smith after which the officers were installed by Rt. Wor. W. D. Coolidge. The first Regular Communication of Caleb Butler Lodge was held on April 9, 1860 at which time nine applications for membership were received. All nine had previously been made Master Masons in Excelsior Lodge. In the first year, thirty-two meetings were held and eleven Master Masons were raised. On or about August 1860, the Lodge moved into new quarters in the Phelps and Harlow Building located at the corner of Main and West Streets. It remained in these quarters until the great fire of 1872. Caleb Butler Lodge's association with the military first appears in the records in conjunction with the Civil War. Fourteen Brethren serve in the Union Army with one being killed in the Battle of Gettysburg on July 21863. Brother Leander G. King was Captain, Co. C, 16th Regiment and Master of Army Lodge No. 2 at the time of his death. Brother King was buried in South Groton on July 22, 1863 by Caleb Butler Lodge with full Masonic honors. "To Saint Paul Lodge-at once our sister and mother Lodge, we were nursed into existence by some of her most prominent members." On April 18, 1872, the entire North side of Main Street was destroyed by a great fire, which lasted for two days. The Lodge lost everything except the Charter and the records, which were saved. The charred remains of the three officers jewels were recovered from the ruins and have been on display in the Lodge rooms ever since. The records show that $475 was received from the Fitchburg Fire Insurance Company for the losses sustained in the fire. During the period from April 1872 to July 1873, the Lodges met in various places including the Irish Benevolent Society Hall and then in the Harvey Wood Building. During this period, since the Lode had no regalia with which to do degree work, they traveled to Fitchburg whenever the occasion required. On October 6, 1873 at a Convention of Saint Paul and Caleb Butler Lodges, the new apartments in the Page Building were dedicated by Most Wor. Sereno D. Nickerson. The Master of Caleb Butler Lodge was Wor. Henry A. Brown who has the distinction of serving the most terms as Master, that being six. The records of this dedication take up twenty-five pages is the book and indicate approximately one hundred fifty were present, including six Past Grand Masters. The minutes of the meeting of April 12, 1875 indicate the Lodges purchased their first musical instrument, a Bruce and Chard Organ No. 897 for $125. On August 12, 1896 Wor. Brother E. D. Bancroft passed away at age 74. He was made a Mason in Aurora Lodge, Fitchburg in 1857, Master of Excelsior Lodge, South Groton under dispensation in 1859, and an honorary member of Caleb Butler Lodge in April 1860 and was organist from 1886 until death. "A copper box in the stone contains all the pertinent papers and records of the fraternal organizations, churches, town departments, post office, court and library of the town, together with the photographs and other valuable evidence of the conditions which existed at that time." "The stone was lowered into its place with the Grand Honors and the sound of the trumpet. It was duly tried by the jewels and being pronounced square, level and plumb, was declared by the Grand Master, well made - well proved - truly laid true and trusty." Corn, wine and oil were poured upon the stone and the Grand Chaplain invoked the blessing of Almighty God upon the undertaking." The installation of officers held on January 30, 1899 was the first meeting held in the new Lodge rooms and they were dedicated on April 19, 1899 by Most Wor. Charles C. Hutchinson, Grand Master of Masons in Massachusetts. Caleb Butler Lodge and Saint Paul Lodge have occupied these apartments from 1899 to the present time. During this period the apartments have also been used by the Bancroft Royal Arch Chapter, Ida McKinley Chapter O. E. S., Ayer Chapter Order of DeMolay, Ayer Assembly No. 104 of the Rainbow, Sojourners Club of Fort Devens and Tahattawan Lodge. The 50th Anniversary of Caleb Butler Lodge was held on March 14, 1910 and was attended by the Most Wor. Dana J. Flanders, Grand Master of Masons in Massachusetts and his suite. The 50th Anniversary history was presented by Wor. Fredrick Whitney. On October 13, 1913, Caleb Butler Lodge presented Past Master's Jewels to 21 of the 27 living Past Masters who were present. The other six were all out of the state but sent letters regretting that they could not be present. On May 17, 1915, a unique meeting took place at Caleb Butler Lodge with Most Wor. M. M. Johnson, Grand Master of Masons in Massachusetts attending. Rt. Wor. Albert A. FiUebrown had the honor of raising his uncle, his brothers, Bro. W.W. Fillebrown and Bro. A. P. Fillebrown, and his cousin Bro. W. F. Bryant. During the period of the First World War the Lodge experienced its largest gain in membership and its busiest period. In the calendar year 1918, 134 meetings were held and 191 Master Masons signed the By-Laws. Also during this period attendance at meeting ranged up to 250, and 40 plus applications received at a meeting were not uncommon. Between 1917 and 1925, a period of 8 years, a gain in membership of 516 is recorded. Not only were members made for this Lodge, but the degrees were worked on many as a courtesy to other Lodges all over the country. At one meeting there were 28 different jurisdictions represented. Our By-Laws contain the names of nearly 700 Brothers who served in World War 1. Out of all these members, only one met death in battle. Lt. Bro Richmond Young was killed in France on October 10, 1918. After the closing of the Regular Communication on April 13, 1925, the "remainder of the evening was given over to the advancement of good fellowship." Seven other organizations were represented, including the Hiberians, Odd Fellows, Knights of Pythias, Royal Arch Masons, DeMolay and the F. O. E.
On September 10, 1928, a request was read from five Brethren residing in Littleton asking for permission to form a new Lodge in that town. This request was voted on and approved on October 8, 1928, thus Tahattawan Lodge chartered in 1929. The 75th Anniversary of the Lodge was held on June 18, 1934 with Wor. Thomas A. Manktelow presiding and was attended by Most Wor. Curtis Chipman, Grand Master of Masons in Massachusetts, and his suite. Wor. Manktelow was presented his 50 year Past Master's Certificate in 1984. The 75th Anniversary history was presented by Wor. Kimball W. Martin. At the annual installation held in October 7, 1935, Wor H. Q. A. McCollister was presented a Past Master's Jewel which was constructed from one originally presented to his Grandfather Wor. J. Q. A. McCollister who was Master in 1872 and a charter member of both Excelsior and Caleb Butler Lodges. Tuscan Lodge No. 126 of Hartford, CT paid a fraternal visit to Caleb Butler Lodge on June 4, 1938 and raised a candidate to the Sublime Degree of Master Mason. Wor. Robert E. Price, presiding Master of Tuscan Lodge was raised in Caleb Butler Lodge on June 24, 1918. On June 10. 1939, 52 Brothers of Caleb Butler traveled to Hartford and visited Tuscan Lodge and returned the courtesy including raising one of their candidates with Wor. John G. Strachan presiding. During the Second World War, a number of meetings during the winter months were held in the vestry of the Federated Church due to lack of heat in the Lodge apartments. During this period the membership increased by about 100 but this does not reflect the courtesy degree work done on Brothers stationed at Fort Devens for other Lodges located all over the country, and in later years for Lodges located over the world. Saint Mark's Lodge No. 22 of Derry, NH paid a fraternal visit to Caleb Butler Lodge on February 9, 1948 and Caleb butler Lodge returned the visit on April 23, 1948. At each visit, the Lodges raised candidates to the Sublime Degree of Master Mason utilizing the ritual of their jurisdiction. The 100th Anniversary of the Lodge was held on June 3, 1960 with Most Wor. Laurence E. Eaton, Grand Master of Masons in Massachusetts and suite in attendance. The exercises were held in the Page School and the Grand Master presented Veteran's Medals to Rt. Wor. Frank B. Crandall and Brother Holden C. Harlow. The 100th Anniversary history was presented by Wor. Frederick H. Brown. A new gravestone was dedicated at the grave of Most Wor. Caleb Butler on August 24, 1975 by Most Wor. Stanley F. Maxwell, Grand Master of Masons in Massachusetts. Most Wor. Maxwell spoke of the life of Caleb Butler and then "dedicated the stone with Corn, Wine and Oil, symbolic of Ancient Free and Accepted Masons." The longest trip from the West to the East was completed on October 7, 1978 when Wor Robert D. Barclay was installed as Master. Wor. Barclay was installed as Senior Warden on October 9, 1948 and due to military duty his trip to the East was delayed by 29 years. Over the years, the Brethren of Caleb Butler Lodge have celebrated Saint John's Sunday many times, but possibly the most memorable church service was held on June 10, 1984. On this Sunday, the officers, members and families were welcomed at Saint Anthony's Roman Catholic Church in Shirley. In his welcome the Priest made the following remarks "History is in the making here today when a Polish Priest is assigned to a predominately French parish and the Masons are welcomed here today to worship with us." Any history of Caleb Butler Lodge would be incomplete without mention of several Brothers who gave of their time and unlimited services for the good of all. Between 1891 and 1981, only four Brethren served a Secretary. Of the four, two served a total of 73 of the 90 years. Wor Bro. Elson H. Bigelow served 28 years and Wor. Frank Harmon 45 years. Wor. Harmon sat as Secretary pro tem from January 11, 1937 to October and was first installed as secretary on October 4, 1937. He held that office until October 17, 1981 when ill health forced his retirement. During this period he served as Dad advisor to Ayer DeMolay for many years, held many elected and appointed offices in the Town of Ayer and was active in several other organizations. "My toast to Caleb Butler Lodge is that it may continue to carry the high standard of Masonry down through the years, until time shall be no more." The lodge activity picked up after being dark for the Summer of 1984 with an Official Visit being paid by the District Deputy Grand Master, Rt. Wor. William E. Williams of the Fitchburg 13th Masonic District. This constituted the 1,460th meeting of the Lodge. October of 1984 was a busy month for Caleb Butler Lodge. Mrs. Ida Naparsrek of the Order of the Eastern Star presented a check to the Lodge for $300 to go toward the purchase of new dishwater. At the same meeting, two members who had belonged to the Lodge for more than 25 years could not afford to pay dues. The Lodge, in true and typical Masonic fashion, voted to make them Life Members. That same meeting, W. Bro. George C. Saul presented to the Lodge a Masonic Flag. He had received the flag from Brother Kenny Allison, 33° and W. Bro. Saul had planned to give it to the Grand Lodge. It turned out that the Grand Lodge already had one, so W. Bro. Saul presented it to Caleb Butler instead. Later that same month, the Lodge travelled to the Masonic Home in Charlton to confer the Entered Apprentice Degree on Richard S. Reed, the Director of Fruitlands Museum in Harvard. Brother Robert D. Reed, Richard's father and member of Caleb Butler, was in attendance. On October 27th, the Installation of Officers was held at the bank Building on Main Street. A dinner and dancing followed the meeting at the Fort Devens Officer's Club. 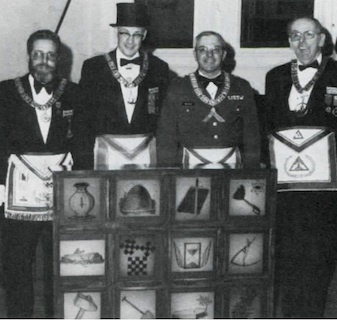 1985 was a banner year for the Lodge in many respects. In March, the Lodge was presented with the Grand Master's Award for work completed under Wor. Eugene Wixom. The Award was signed by M. W. David B. Richardson. June 16th a church service, in conjunction with St. Paul Lodge, was held at the Federated Church in Ayer. June 25th was the date of the 125th Celebration of the Constitution of Caleb Butler Lodge. Ronald E. Jackson, the Right Worshipful Deputy Grand Master - acting as the Grand Master while the latter was out of the Commonwealth - was in attendance. A most unusual circumstance occurred September 12, 1988. The Regular Communication #1500 was declared null and void under a dispensation of the Grand Master, Albert Ames, "For good and sufficient reason". The Lodge had made the request that this be done. Minutes of the meeting were purged from all records. On October 3rd of that year, the District Deputy grand Master, Jack Taub, opened the Lodge for a Special Communication. He was attended by his suite of officers. No elected officers of Caleb Butler were present for this Official Visit. No record of these events is now extant either with the Grand Lodge or Caleb Butler. On June 10th of 1990, the last meeting of Caleb Butler at the Bank Building apartments on Main Street of Ayer was held. At that meeting, the officers and members witnessed the raising of Brother Karl N. Searle to the Master Mason Degree. June 27th of 1990 saw the first meeting of the Lodge at their new residence at 60 Pleasant Street - the Pleasant Street School Building. The Fellowcraft Degree was conferred on Brother William L. Estes to mark the occasion. The official dedication of the Lodge Room was held on September 8th. Wor. Robert V. Stafford and the officers of Caleb Butler Lodge were present to assist M .W. Edgar W. Darling and his suite during the ceremonies. Also present was a large contingent of members from St. Paul's Lodge. Noted and published in the Grand Lodge proceedings, St. Paul's Lodge officially hosted the event. Numbers reported to Grand Lodge occur every year as the Annual Reports are made. In 1990, the numbers reported included the following: 337 members of the Lodge; current dues of $4,375; Grand Lodge Assessment was $2,790; the Lodge brought in fees and other income of $1,803.96; the Treasurer received monies held by the Secretary of $10, 630.02. It was not reported that the $.02 were the opinions of the Lodge Secretary. Administrative review of Lodge records can occasionally contain some lighter moments. Witness the entry for the Regular Communication on April 8, 1991: A dispensation for Caleb Butler Lodge was received from the Grand Lodge for the purpose of holding a Table Lodge on Saturday, April 13th. However, the actual Table Lodge being held on that date was held by St. Paul's Lodge who had assured Caleb Butler that they were already in receipt of an official dispensation to do so. In February of 1992, a joint meeting of three lodges - Caleb Butler, St. Paul, and Tahattawan -under the rubric; "Nashoba Valley Lodges" was held for fellowship and degree work. The Junior Wardens of those lodges held a collection and received $600 which they donated to the Ambulance Services serving the 8 towns and communities from the local area. A team of degree workers from the three lodges performed the ritual for the evening. Another example of close collaboration of lodges occurred in July of that year. At a Special Communication of Caleb Butler Lodge, the Worshipful Master and Officers of Tahattawan invited the ladies of both lodges to a potluck supper and a social visit. Later, they witnessed the officers of Caleb Butler confer an Entered Apprentice degree on one of the Tahattawan candidates. It should also be noted here that, for the first time since 1934 (except for the years of WWII) Caleb Butler continued to hold regular communications during the months of July and August rather than "go dark" as was the usual custom. Worshipful Brother Dakin, the master of the Lodge, and his officers maintained a steady workload of degrees. To compensate the membership for a lack of time off during the warmer months, "casual dress" was adopted for those meetings. The last meeting of the year 1992 included a vote by the members to spend $75 for purchase of glass for the Master's Carpet cabinet which is located in the Lodge Room. It is hoped that when the Lodge continues to make such purchases, note is made of them in the official records. That kind of information is absolutely essential for Lodge historians. An example of the kind is also noted when in April of 1993, a committee of three - Worshipful Brothers Tony Caprio and Milt Starr, along with the Junior Deacon at the time, Bob Maxwell, were charged with investigating the purchase of new aprons for the Lodge. Their investigation led to the purchase of 30 white aprons which were made by the Ladies of the Oriental Shrine and were to be used for Masonic funerals. They also purchased a new set of officer's aprons at a cost of $616.00. Membership increased slightly during the early 1990's and in May of 1993, Wor. David Dakin received a "Plus One" plaque from the Grand Lodge for raising 11 candidates the previous year. On hand to make the presentation was R. W. Frank O. Collins, the District Deputy Grand Master along with the Master of Caleb Butler, Worshipful Brother Timothy Bemis. Another festive occasion occurred in June of 1993. R. W. Brother H. Arnold Wilder was presented his 60 year pin and a Grand Lodge Life Membership. He said, at that time, that he had gotten much more out of Freemasonry than he had ever given to it. He should have measured his words more carefully - the Lodge was going to get a great deal more service out of Brother Wilder in the years to come. The Lodge continued to remain very active during the 90 's with frequent visits by the various District Deputy Grand Masters. The Christmas program grew and the Lodge provided a Christmas for many needy families in the area in addition to visits and gifts to widows of our brothers and brothers that were incapacitated. In October of 1993 the Lodge voted to donate $100 to the Gettysburg Masonic Memorial in memory of Worshipful Leander G. King, a charter member of Caleb Butler Lodge that died in the battle on July 3, 1863. The Lodge joined with St. Paul Lodge a few times during the 90's to travel to the Masonic Home in Charleton, MA to perform some degree work and join the residents in a luncheon. There has been a rather long history of the members of the Lodge enjoying meals with their functions. Many times during the 90's and 2000's Worshipful Eugene Wixom and his helpers, known as "The Itsy Bitsy Catering Company", provided wonderful meals for the members. On October 7, 1995 a historical event took place. Caleb Butler Lodge held a public installation of officers and its special guests were some members of Crispus Attucks Lodge 24, Prince Hall Masons. The guests were Wor. Thomas Wilson, Jr., and Brothers Tidmore, McKinney, Owens, Isaacs, Douglas, Williams and McMillan. Wor. Wilson stated "How great it is for Brothers to meet in harmony after so long and that the members of his Lodge certainly felt at home, especially since so many of us know each other outside the Lodge." The newly installed Master, Wor. Kenneth Lewis was presented an original painting of the Pleasant Street School Masonic Apartments painted by Brother Harding Bush. During 1998, Wor. Andrew Waugh introduced us to some Masonic Brothers from Scotland and created a bond between Caleb Butler Lodge and some Lodges in the Inverness, Scotland area. This has resulted in several visits to Scotland by members of our Lodge and several visits to our Lodge by our Scottish Brothers. Around this time also, Marilyn Stafford, widow of Wor. Robert Stafford, found a "Traveling Paper" from Shefford Lodge 18 in Waterloo, Quebec, Canada among some of her husband's papers. A meeting was arranged and a delegation from our Lodge visited our brothers in Canada and returned the letter. This has resulted in several visits of our brothers to Canada and visits by the Canadians to our Lodge. Wor Paul Poirier led one of our visits to Canada in 1999 and Wor. Charles Jones led the visit in March, 2005 when Shefford Lodge celebrated its 150th anniversary. Wor. Jones met with M. W. John E. Leide, Grand Master of Quebec and Wor Dexter W. E. Larose, Master of Shefford Lodge at that meeting and Marilyn Stafford was honored for her role in creating the friendship between the two Lodges. On November 20, 1999, Caleb Butler Lodge held a public dedication of its new apartments at 11 Scully Road in Ayer. Wo.r Charles Jones welcomed the Most Worshipful Grand Master Fred Kirby Bauer and the Grand Master and his suite performed the ceremony of dedication. Wor Paul Poirier was the Architect of the renovation and he presented the plumb, level and square to the Grand Master. After the dedication, a reception was held at the Bull Run Restaurant and the Grand Master presented plaques of appreciation to Wor. Gene Wixom, Wor. Milt Starr and Brothers Norman Carkin and Dan Taylor for their work on the new apartments. Wor. Wellman Parker presented a Certificate of Recognition from the Ayer Board of Selectmen and Brother Robert Hargraves, State Representative, presented a Resolution from the Massachusetts State House of Representatives. He also presented a special thank you from the State Legislature to the Wor Anthony Caprio's wife, the late Rose Caprio, for all the social work she had performed. One of the highlights from the association of the Lodge with our Canadian and Scottish brothers occurred on October 20, 2001 when there was a combined meeting of the three Lodges in our Masonic apartments. At this meeting, each Lodge exemplified one of the degrees with our Scottish Brother Craig Ross serving as candidate. Brother Craig Ross had recently been raised by his father Wor. Frasier Ross, Past Master of Lodge Priory #1235. Canadian Lodge 18 from Waterloo Quebec exemplified their first degree, Caleb Butler Lodge exemplified the second degree, and the Scottish Masons exemplified the third degree. The Scots had bagpipe music and Wor. Frasier Ross served as Master with his father serving as Senior Deacon. After the degree work, Wor. Bro. Ross presented the mallet they used, a check for the relief fund and a painting of Bro. Robert Burns to the Worshipful Master, Rick Skoczlas. In September 2002, while Wor. Skoczlas was Master it was announced that the Masonic Districts in Massachusetts were to be reorganized and Tahattawan and Caleb Butler Lodges would join the 14th Masonic District. This was a rather sad event for many of the members as they had a long friendship with the members of the various Lodges in the 13th Fitchburg Masonic District. However, the reorganization brought the Lodge together with many different Lodges and new friendships and a special Tri-Lodge meeting was established. Three of the Lodges in the 14th Masonic District meet on the 2nd Monday of the month and we now meet together once a year for the Fraternal Visit of the District Deputy Grand Master. R. W. H. Arnold Wilder has continued to be recognized for his outstanding service to Masonry. On June 9, 2003 he was presented his 70 year pin. In March of 2008, Most Worshipful Roger William Pageau, Grand Master of Masons in Massachusetts and a very distinguished suite, including the Deputy Grand Master and both Grand Wardens, were present at Caleb Butler Lodge to present RW H. Arnold Wilder with his 75 year pin. Following the ceremony, a banquet in Brother Wilder's honor was held at the Ayer Gun and Sportsmen's club. This was a great day in the history of the Lodge. On November 11, 2003, Worshipful Brother James P. Bursey was stationed as a Staff Sergeant with the 110th Maintenance Company in the war zone of Iraq. On that day, he flew an American flag over his tent, photographed it, and later presented it to the Lodge. The flag now is encased with a copy of the photo and a plaque declaring the presentation to be in honor of all Brethren who served in the Massachusetts National Guard with the 110th Maintenance Company. The flag can be seen in the entranceway to the lodge room. Sometime over the summer of 2006, the Tyler's sword which was ever at the ready to defend the Lodge from intruders, itself succumbed to the hands of thieves. The disappearance was and continues to be a mystery. However, on January 8th of 2007, Wor. Geoffrey Kromer presented the Tyler, Brother R. Brooks Maxwell with a U.S. Marine Corps NCO Saber. The saber was a gift from Wor. Bro. Anthony B. Rahatt, Past Master of the Pride of Fairfax Lodge #298 (Prince Hall) in Alexandria, Virginia. Bro. Rahatt was a Sergeant Major in the U. S. Marine Corps, serving at the Pentagon that answered a plea for a replacement Tyler's sword. It was especially appropriate that Bro. Maxwell was serving in the U.S. Navy at the time of the presentation. In thanks for the sword, a generous donation was made to Pride of Fairfax Lodge #298 scholarship fund by Caleb Butler Lodge. Subsequently a display and storage case was built for the sword by Wor. Eugene Wixom and the saber hangs safely and securely outside the lodge room. The 14l Masonic District has held 7 Tri-Lodge Fraternal Visits since the creation of the new District in 2003. The seventh Tri-Lodge Meeting of the 14th Masonic District was held on February 12, 2007 in the Masonic Hall in Concord, MA. The three lodges in the District that meet on the same night [the second Monday of the month] - Caleb Butler, Corinthian, and Simon W. Robinson — met to confer a joint Fellowcraft Degree on 12 candidates. The officers of Caleb Butler conferred the First Section of the Degree, the Second Section was performed by Simon W. Robinson, and the Master's Lecture was done by the Worshipful Master of the Host Lodge. The dinner was provided by Corinthian Lodge and a wonderful time was had by all those in attendance. It was quite a sight to see with "standing room only" in the lodge room. A special motion was made during the business of the Lodge on September 10, 2007. Brother Leander King, a charter member of the lodge and a Past Master of Army Lodge Number 2, was made an Honorary Past Master of Caleb Butler Lodge. Wor. Brother King was the first member of the Lodge to pass away, having been killed on the Second Day of the Battle of Gettysburg during the Civil War. Capt. King's picture as Commander of Company C, 16th Regiment, Mass Volunteers, in full uniform, hangs in the Dining Hall of the Lodge. His body lies in repose in Woodlawn Cemetery in Ayer. At the same meeting, the members also passed a motion to remit the dues of Brethren serving in the armed forces and in particular involved in the Iraq and Afghanistan combat theatres while they are on their tour of duty overseas. These two Patriotic Acts are in keeping with the strong military support that Caleb Butler Lodge has provided over the years. In December of 2007, Wor. Geoffrey Kromer received the Grand Master's Award on behalf of Caleb Butler Lodge during the Quarterly communication of the Grand Lodge of Massachusetts. Previously, Wor. Brother Dakin (1982) and Wor. Brother Wixom (1984) had also received the Award. Wor. Brother David Winters would be the latest Caleb Butler Master to receive that award, garnering the honors on February 9l of 2009. At that time, it was revealed that of the 230 constituent lodges in the Grand Jurisdiction of Massachusetts, only six received the award. At the January 14l , 2008 meeting, the first Lewis Jewels of the grand Lodge of Massachusetts were presented to members of Caleb Butler Lodge. These jewels recognize the holder as being raised a Master Mason at the time that their fathers were [or in the case of they being deceased, having been] Master Masons. The first two recipients of the honor were Wor. Brother Richard W. Skoczylas and Bro. Walter "Rick" Dickson, Jr. The jewel, suspended from the left breast pocket, is a gold "Lewis device" below two bars with the dates of the Father's initiation and the son's initiation into the Craft. On March 10, 2008, Caleb Butler entered the age of cyberspace. At that time, the website of the lodge was launched over the internet: http://www.calebbutlerlodge.com. The website was constructed and introduced to the international audience of internet "surfers" by Brother Robert Lindberg. Since the date of the launch, it has become a most helpful means of communication for all those that are wired into the 21st Century. At the meeting of the Lodge on September 27, 2008, two things happened of historical note: Wor. David Winters presented a "Traveling Square" to the newly installed Worshipful Master, R.W. Ernest A. Bean, and Wor. Barry Kromer of Putnam Lodge #46 of South Woodstock, CT -and an affiliate of Caleb Butler Lodge - presented a hand carved setting maul to the new Master. The first item marked a continuance of a tradition begun two years earlier of passing along a lapel pin in the form of a Master's Square to be worn when the incumbent Worshipful Master of Caleb Butler Lodge visited other lodges. The second item was hand carved by Wor. Barry Kromer (father of Wor. Geoffrey Kromer of Caleb Butler) from the wood of a tree which had fallen on the historic lodge in Connecticut. The lodge, is the site of the famous Annual Meeting Fumigation, attended by many of the members of Caleb Butler. The hickory setting maul should last for many years to come and everyone appreciated the gesture from our Worshipful Brother to the South. We, the members of the Committee for writing this history, wish the Lodge and all those who compose her Peace, Harmony, and Prosperity in the years to come; that our children and grandchildren may gather within her walls in the time-honored traditions of the Craft - becoming ever better men, better husbands and fathers, and better citizens in their quest for Masonic improvement and perfection. A dispensation has been issued for a new Lodge at South Groton, in this State, under the name of Excelsior Lodge, and will, we understand, go into immediate operation under favorable auspices. We could have preferred a different name, — one more suggestive. O. N. Wing, W. M.
B. F. Taft, S. W.
J. N. Roberts, S. D.
G. H. Champney, J. D.
J. Q. A. McColIister, Chaplain. At the conclusion of the ceremonies the Brethren sat down to an elegant and excellent supper, provided at the new hotel in the village. There an hour was spent in a very agreeable manner. The Lodge has a convenient hall and the prospect before it most encouraging. Its officers are competent and zealous, and the members interested in its success. 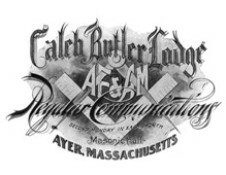 The fiftieth anniversary of Caleb Butler Lodge, Ayer, Mass., was celebrated Monday, March 14th. The exercises began with a business session of the lodge at one o'clock. At two o'clock the anniversary exercises opened with reception of Most Worshipful Dana J. Flanders, Grand Master. An address of welcome was given by Worshipful Brother Albert A. Fillebrown, Past Master of the lodge. A history of the lodge was read by Past Master Frederick Whiting. Addresses were made by Grand Master Flanders, Deputy Grand Master William H. Rider, Senior Grand Warden Clarence A. Brodeur and Past Grand Warden Oliver A. Roberts. At 8:30 a banquet was served and later the lodge was opened for business and work, The musical portion of the program for the day was furnished by the Harvard Quartet. Caleb Butler Lodge Receives "More Light"
It was a dream in a young Mason's mind that he should do something that would memorialize his father's name in the Lodge that had embraced them both and had made them "brothers." Bro. Frederick Norman Parsons entered into the Craft soon after he had attained his DeMolay majority. Caleb Butler Lodge, in his hometown of Ayer, MA, was the choice and his father presented his petition. Eventually his employment with the MA Department of Public Works forced his removal to Melrose, MA, where he settled until his retirement a few months ago. He began to lay plans for the construction of a device that would be useful to the Lodge and would embellish the ritual work presented by the Master in the East. He zeroed in on the display of the emblems in the Master Mason Degree, and confided his plans to two of his Masonic neighbors. Finally a beautiful display case (lighted figures) was constructed to be used during the explanation of the ritual in the third section of the degree. On May 14, 1984, Bro. Parsons, accompanied by a delegation of Masonic friends and coworkers in the Craft, journeyed to his hometown and formally presented his "Father's Memorial" to the Lodge, where it will be used to teach new Masons the lessons inculcated in the ritual and help to spread the light of knowledge to "those who might otherwise have remained at a perpetual distance." The accompanying photo depicts the principals who were in attendance on that evening, when the D. D. G. M. paid a Fraternal Visit, and when three candidates were Raised by a degree team composed of brethren of the MA National Guard. presently Rt. Ill. D.G.M. of the Grand Council, Royal and Select Masters of Massachusetts. This page was last modified on 28 December 2018, at 08:51. This page has been accessed 54,445 times.